I've seen a couple of cards with band-aid stamps on them in various cardmaking magazines but I didn't have a stamp like that in my collection. What to do when you really want the look? 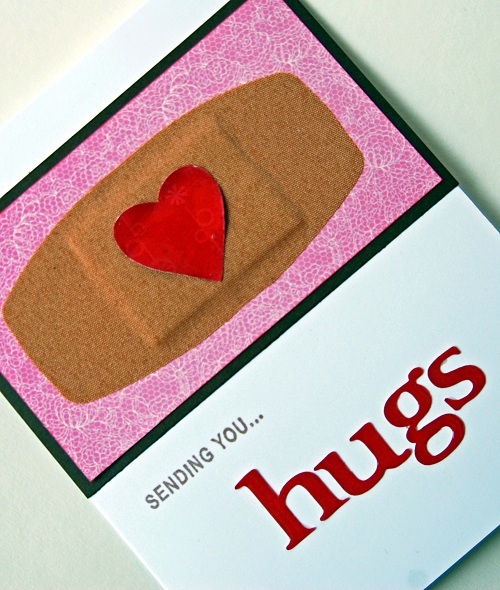 I dug into my medicine cabinet and found a big honking band-aid to add to the front of this card! I made this for the wife of one of my martial arts buddies who had to have surgery for an injury she received at her workplace. How easy to make this one - just frame out a band-aid, add a 1" heart and some letters from the AP cartridge! I'm so glad I had the chance to do a photo session today while my boys are wrapped up in movies on the couch. The doctor said its a flu virus - what a bummer after we all were immunized in October. It will probably hang around for several more days before they are back to the land of the living. Thanks for stopping by today! Paige - this is a scream!!! 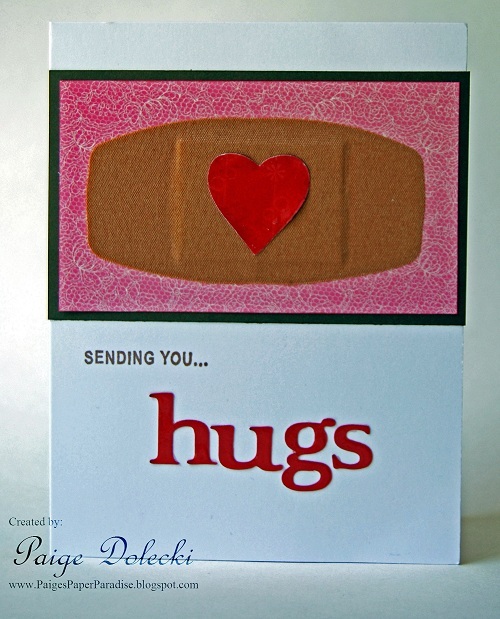 Oh my goodness, I just saw this on Pinterest and had to scoot over here and tell you how hilarious this is with a real bandaid! Thanks! I thought it was pretty funny too! I'm planning on adding it to my next card class. Very easy to make boy and girl versions!